Hastings+Chivetta Architects, along with Portland, Oregon firm Opsis Architecture have been selected as Athletic Design Architect and Architect of Record respectively for the new $30 million, 4,700-seat University of Idaho Arena. The design and construction of UI’s new Arena represents an exciting new chapter for the University’s time-honored tradition of collegiate athletics and is planned to become a catalyst for recruitment. It will be designed as a multi-event and court sports facility home to several sports programs, including men’s and women’s basketball and volleyball. Additionally, the Arena will serve as a gathering place for academic events, special concerts and meetings. The University of Idaho plans to make timber and mass timber construction a focal point of the project. The University got a nod from the U.S. Forest Service as part of a national movement to expand use of wood products in construction. A highly-competitive Wood Innovation Grant will help kick into high gear the construction of the Arena which will be the first signature wood facility of its size in the state. The Arena will also serve as a learning laboratory for students in forestry, engineering and more. Slated for construction on the north side of the Kibbie Dome, the new venue will strengthen recruiting, rally fan excitement and serve as an activity center for university-wide activities. It will be a showpiece for student-athletes, tell the story of Idaho’s heritage and provide a unique gathering place for generations of Vandals to come. Also selected for the project are KPFF Structural Engineers and Hoffman Construction as General Contractor. 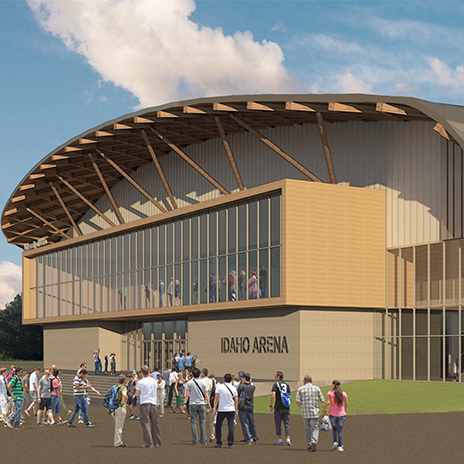 The University of Idaho plans to open the Arena by 2020.